greetings from NC - with a new to us '89 Vanwagon! 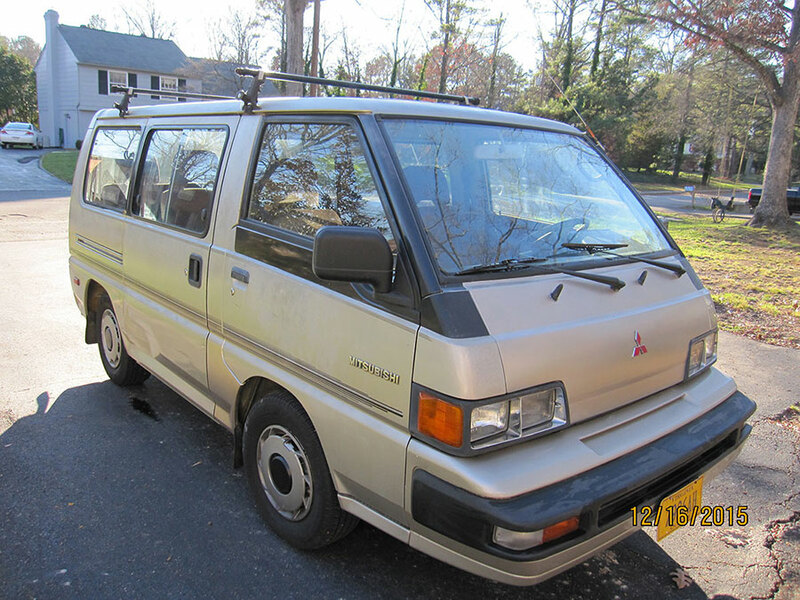 wife and I just purchased a new to us '89 Mitsubishi Wagon.. LHD, 2WD, with the 4G64 2.4L petrol engine. a little over 220k on the body and around 5k on a new to it motor from japan around a decade ago (it sat on and off for a number of years from the PO) - it has some issues which I hope to work through (mostly low power, OD currently not working, and a bit of a rough idle) if you frequent other Delica forums you might have seen the van for sale in Richmond. hoping we didn't impulsively get in over our head, but the silver lining to our daily car getting totaled by idiots in a stolen SUV running a redlight and t-boning our wife is we ended up getting a 2nd vehicle along with what we replaced our previous SUV with (R.I.P. CRV). the previous owner had put a lot of cash into getting the an running properly but with limited mechanical abilities himself - I'm a bit of a novice myself but good with my hands and a quick learner - been doing all of our other cars work myself for the past couple of years now as a "challenge" to myself (timing belt, alternators, AC fans, brakes/rotors, oil changes etc) - slowly buying tools now that we have a home we own and a secure place to keep them etc. I sent a couple private messages to members here hoping to extract and take on some more information and to maybe help with a few questions! hopefully this week (if the biting cold wind and rain would let up! although if some of you knew the temp's I'm complaining about you'd shake your head at me) I can get out there and start on my list of things I want to update, change and replace as most of the repairs even though not driven much were done near a decade ago at this point and it did sit periodically longer than it should. anyway hope to pick up some more info here and as we go along with repairs on ours can hopefully document and provide a bit of info that might help others like me who are ...learning as we go hah! Re: greetings from NC - with a new to us '89 Vanwagon! Incidentally, we've opened a new sub forum for van meets in the USA. Kind of general, I know ~ not even sure if it's going to take off but if it grows we'll start getting more specific. In the meantime ~ please make yourself at home. P.S. : Nice wagon you have there. Congrats on your new addition. I loved my 89 LS when I had it, but due to poor owners before me it became a money pit. I sold it on, and then set my sights on getting a real Deli a few years later which I did in 2014. The Vanwagons are actually quite easy to repair. They seem daunting due to the layout of the engine bay, but they are well laid out in my opinion. I had to replace the cylinder head on mine shortly after buying it. I was really worried about this repair, but it was pretty simple. I would recommend removal of the radiator when doing the belts, but it may not be necessary. It will make your life a lot easier, and keeps the fragile rad out of the way when doing the repair. Remember the engine in those vans are non-interference engines, so no worries about messing up the timing to the point of ruining the engine. When I did my belts during the head replacement I never put the balance shaft belt back on. My Mitsubishi guru said that it really didn't do all that much, and when the small balance belt fails it will ball up and wreck the main timing belt. I didn't notice any bad vibrations from not having the balance belt on for what it's worth. As far as the OD not working there is a temp switch on the thermostat housing(actually may be 2 or 3) that won't allow OD to work unless the engine is at a set temp. This sensor could be bad, and not allowing the OD to engage. I believe there is one sensor that locks out AC before the engine is at temp as well. I recommend getting the factory manual. It was reasonably cheap compared to other factory manuals I've purchased over the years and worth the investment. From it will stem your confidence in doing things by reading about them in advance. Heads up the dist cap/plug wire replacement is a pain due to the cap on one side and engine on the other side. So don't try to do it without removing the driver's seat and the steel floor section that unbolts for access. This makes it much simpler. Otherwise you are literally walking around the vehicle back and forth fitting each wire. Long story but I'm a good wrench and that was the wrong way to do it. The wires were poor quality, so a month later I did it all over again but the right way. Trans is straight forward but be sure you know what bolts to undoo to access the filter. Open the wrong bolts and tiny bits will rain all over the garage floor and you may have to throw away the transmission. Get the factory manual 2-set. Welcome! IdahoDoug wrote: I recommend getting the factory manual. It was reasonably cheap compared to other factory manuals I've purchased over the years and worth the investment. From it will stem your confidence in doing things by reading about them in advance. Heads up the dist cap/plug wire replacement is a pain due to the cap on one side and engine on the other side. So don't try to do it without removing the driver's seat and the steel floor section that unbolts for access. This makes it much simpler. Otherwise you are literally walking around the vehicle back and forth fitting each wire. Long story but I'm a good wrench and that was the wrong way to do it. The wires were poor quality, so a month later I did it all over again but the right way. anyways, other than stockpiling the parts - not much going on here this winter! just doing projects to our new house getting it more settled! Good luck with the maintenance. Once this is taken care of, it may prove to be a nice sturdy little transporter. Ours never fails to start instantly even in the middle of winter when it sat for a month. I put roof racks on it for kayaks, and just discovered a week ago that against all odds our Costco kayaks will actually fit INSIDE it just barely. A towel in the back window to prevent chafing of the defroster wires and it shuts within a half inch. It also does the best donuts in the snow! And we laid the seats down, put an air mattress atop them all, and made quicky blackout window covers for the windows with the foil insulation from Home Depot and camped in it a few nights. A versatile and fun personality. this....never ended up happening. its been dead in our carport since something killed the battery. keep it topped off with a trickle charger for a decent while but then those times I charged it dwindled. no time and my competence levels were shook replacing so many things. have the parts. am probably just going to end up taking a bath on this considering what we paid and sell it at some point sooner than later. such a cool van, unfortunately the "few months out of commission" for my wife is now at 3 years of still being miserable/hasn't been able to return to work. hope all is well with folks here! how are you making out with van? i am looking for an engine for mine. any help?